How producers of public goods persist in microbial communities is a major question in evolutionary biology. Cooperation is evolutionarily unstable, since cheating strains can reproduce quicker and take over. Spatial structure has been shown to be a robust mechanism for the evolution of cooperation. Here we study how spatial assortment might emerge from native dynamics and show that fluid flow shear promotes cooperative behavior. Social structures arise naturally from our advection-diffusion-reaction model as self-reproducing Turing patterns. We computationally study the effects of fluid advection on these patterns as a mechanism to enable or enhance social behavior. Our central finding is that flow shear enables and promotes social behavior in microbes by increasing the group fragmentation rate and thereby limiting the spread of cheating strains. 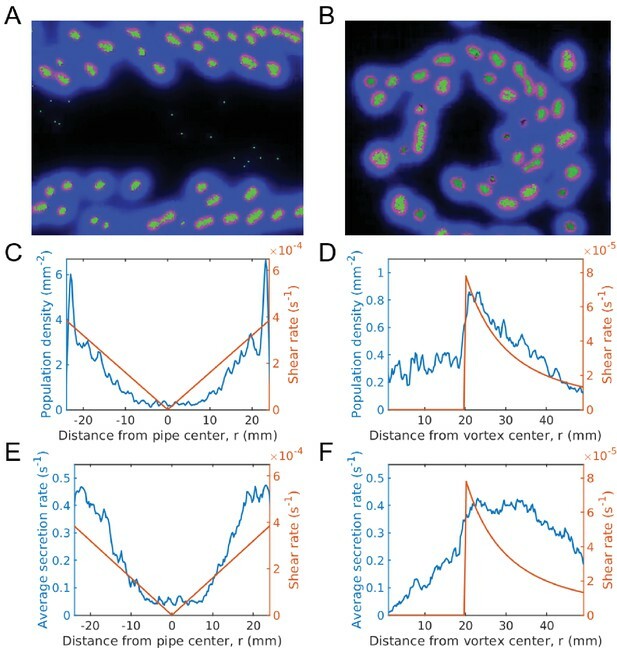 Regions of the flow domain with higher shear admit high cooperativity and large population density, whereas low shear regions are devoid of life due to opportunistic mutations. According to the principle of the ‘survival of the fittest’, selfish individuals should be better off compared to peers that cooperate with each other. Indeed, even though a population of organisms benefits from working together, selfish members can exploit the cooperative behavior of others without doing their part. These ‘cheaters’ then use their advantage to reproduce faster and take over the population. Yet, social cooperation is widespread in the natural world, and occurs in creatures as diverse as bacteria and whales. How can it arise and persist then? One idea is that when individuals form distinct groups, the ones with cheaters will perish. Even though a selfish individual will fare better than the rest of its team, overall, cooperating groups will survive more and reproduce faster; ultimately, they will be favored by evolution. This is called group selection. Here, Uppal and Vural examine how the physical properties of the environment can influence the evolution of social interactions between bacteria. To this end, mathematical models are used to simulate how bacteria grow, evolve and drift in a flowing fluid. These are based on equations worked out from the behavior of real-life populations. The results show that flow patterns in a fluid habitat govern the social behavior of bacteria. When different regions of the fluid are moving at different speeds, ‘shear forces’ are created that cause bacterial colonies to distort and occasionally break apart to form two groups. As such, cooperative groups will rapidly form new cooperating colonies, whereas groups with cheaters will reproduce slower or perish. Furthermore, results show that when different areas of the fluid have different shear forces, social cooperation will only prevail in certain places. This makes it possible to use flow patterns to fine tune social evolution so that cooperating bacteria will be confined in a certain region. Outside of this area, these bacteria would be taken over by cheaters and go extinct. Bacteria are both useful and dangerous to humans: for example, certain species can break down pollutants in the water, when others cause deadly infections. These results show it could be possible to control the activity of these microorganisms to our advantage by changing the flow of the fluids in which they live. More broadly, the simulations developed by Uppal and Vural can be applied to a variety of ecosystems where microscopic organisms inhabit fluids, such as plankton flowing in oceanic currents. Cooperation is the cement of biological complexity. A combined investment brings larger returns. However, while cooperating populations are fitter, individuals have evolutionary incentive to cheat by taking advantage of available public goods without contributing their own. Avoiding the cost of these goods allow larger reproduction rates, causing cheaters to proliferate until the lack of public goods compromise the fitness of the entire population. In other words, while cooperating populations are fitter than non–cooperating ones, cooperation is not evolutionarily stable. How then can social behavior emerge and persist in microbial colonies? The evolution of cooperation is an active field of research, with multiple theories resolving this dilemma (Axelrod and Hamilton, 1981; Sachs et al., 2004; Sachs and Simms, 2006; Nowak, 2006). According to (Fletcher and Doebeli, 2009) the fundamental mechanism is assortment. That is, in order for cooperation to evolve, cooperators and cheaters must experience different interaction environments. How this assortment is achieved is a central question. Possibilities include positive and negative reciprocity (Trivers, 1971; Clutton-Brock and Parker, 1995; El Mouden et al., 2010), where cooperators are rewarded later by others, or where cheaters are inflicted a cost, via policing or reputation. For example, quorum signals reveal whether available public goods add up to the population density. In this case, altruists cut back public good production to eliminate cheaters (albeit with collateral damage) (Allen et al., 2016; Sandoz et al., 2007; Diggle et al., 2007). Another idea is group selection (Wynne-Edwards, 1962; Haldane, 1932; Traulsen and Nowak, 2006; Wilson, 1975) and its modern incarnation, multi-level selection, (Wilson and Sober, 1994) which propose that cooperating groups (or groups of groups) will reproduce faster than non-cooperating ones and prevail. Kin-selection theory (Hamilton, 1964a, 1964b; Williams, 1966; Smith, 1964; Hamilton, 1975; Lion et al., 2011) provides a mechanism that arises from individual level dynamics. Kin-selection proposes that individuals cooperate with those to which they are genetically related, and thus, a cooperative genotype is really cooperating with itself. Hamilton conjectured that kin selection should promote cooperation if the population is viscous, that is when the mobility of the population is limited (Hamilton, 1964a; Hamilton, 1964b). This helps ensure that genetically related individuals cooperate with each other. However, competition within kin can inhibit altruism (Taylor, 1992; Wilson et al., 1992). One solution to this is if individuals disperse as groups, also known as budding dispersal. This was shown to promote cooperation theoretically by Gardner and West (2006) and demonstrated experimentally by (Kümmerli et al., 2009). Budding dispersal has also been studied by (Pollock, 1983; Goodnight, 1992; Kelly, 1994) and by (Wilson et al., 1992) from a group selection perspective. There may be multiple and overlapping mechanisms underlying assortment. There is much debate in the literature over which theories best explain the evolution of cooperation and under which conditions each theory may be applicable. There is still not agreement, for example, on whether kin-selection and group selection can be viewed as equivalent theories (Lion et al., 2011; Kramer and Meunier, 2016). According to (Simon et al., 2012; Simon et al., 2013), since relatedness need not impact certain group level selection events, such as various games between groups, group selection is distinct from kin selection. Also, individual and group level selection events are generally asynchronous in nature and therefore cannot be equivalent. However, the debate still goes on (Kramer and Meunier, 2016; West et al., 2007; Gardner, 2015; Goodnight, 2015). Typically, evolution of cooperation is quantitatively analyzed with the aid of game theoretic models applied to well-mixed populations, networks and other phenomenological spatial structures (Szabó and Fáth, 2007; Allen et al., 2013; Nowak and Sigmund, 2004; Vural et al., 2015). While there are few models that take into account spatial proximity effects, (Medvinsky et al., 2002; Nadell et al., 2010; Nadell et al., 2013; Dobay et al., 2014; Driscoll and Pepper, 2010) and the influence of decay and diffusion of public goods (Dobay et al., 2014; Wakano et al., 2009; Hauert et al., 2008), how advective fluid flow influences social evolution remains mostly unexplored. The present study aims to fill this gap. A flowing habitat can have a drastic effect on population dynamics (Tél et al., 2005; Nickerson et al., 2004; Koshel' and Prants, 2006; Sandulescu et al., 2008). For example, a flowing open system can allow the coexistence of species despite their differential fitness (KarolyiKárolyi et al., 2000). Interactions between fluid shear and bacterial motility has been shown to lead to shear trapping (Rusconi et al., 2014; Berke et al., 2008) which causes preferential attachment to surfaces (Berke et al., 2008; Li et al., 2011). Turbulent flows can also lead to a trade-off in nutrient uptake and the cost of locomotion due to chemotaxis (Taylor and Stocker, 2012), and can drastically effect the population density (Pigolotti et al., 2012; Perlekar et al., 2010). Most importantly, the reproductive successes of species (and individuals within a single species) are coupled over distance, through the secretion of toxins, goods, and signals (Mimura et al., 2000; Allison, 2005; Hibbing et al., 2010). The spatial distributions of all such fitness altering intermediaries depend on flow. Indeed, the experimental study by Drescher et al. (2014) has shown that flow can help promote cooperation in bacterial biofilms. Thus, we are motivated to find out how flow plays a role in the evolution of cooperation. Here we theoretically study how fluid dynamics molds the social behavior of a planktonic microbial population. Qualitatively stated, our evolutionary model has three assumptions: (1) Individuals secrete one waste compound and one public good. The former has no cost, whereas the latter does. (2) Mutations can vary the public good secretion rates of microbes, thereby producing a continuum of social behavior. (3) Microbes and their secretions diffuse and flow according to the laws of fluid dynamics. Under these assumptions, we find, through computer simulations and analytical theory, that bacteria self organize and form patterns of spots, which then exhibit an interesting form of budding dispersal when sheared by ambient fluid flow. The dispersal process preserves the group structure, thereby enabling evolutionarily stable social behavior. Our model is applicable to a wide variety of social ecosystems ranging from phytoplankton flowing in oceanic currents to opportunistic bacteria colonizing blood or industrial pipelines. Our findings imply that greater social complexity amongst planktonic species would be observed in regions of large shear, such as by rocks and river banks. We might even speculate that multicellularity may have originated near fluid domains with large shear flow, rather than the bulk of oceans or lakes. This paper is organized as follows: We first establish that under certain conditions our physical model gives rise to spatially organized cooperative structures. The structures are a natural byproduct of the dynamics of the system. Furthermore, these social structures reproduce in whole to form new identical structures. Variants of such structures have already been studied in ecological settings (Tian et al., 2011; Camara, 2011; Baurmann et al., 2007; Wilson et al., 2003) and growth patterns of microbial populations havebeen explored (Ben-Jacob et al., 1994; Chang-Li et al., 1988). We then study the effects of mutation. We first start with a simplified model with only two phenotypes: cheater and altruist. We then generalize to a continuum of public good secretion rates. In both cases, we observe that above a certain mutation rate, cheating strains take over groups which leads to total extinction. The latter finding is consistent with other empirical (Rainey and Rainey, 2003; Diggle et al., 2007) and theoretical studies (Nowak and May, 1992).Through the fragmentation of social groups, and death of cheating groups, we recover the results of Simpson’s paradox (Chuang et al., 2009) where individual groups may decrease in sociality, but the population as a whole becomes more social. After setting up the stage for naturally forming social groups, we present our central and novel finding, that flow shear can lead to evolutionarily stable cooperative behavior within the population. Specifically, we demonstrate and study the evolution ofsociality of a microbial population (1) subjected to constant shear, (2) embedded in a cylindrical laminar flow and (3) in a Rankine vortex. We find that in all three cases population density and cooperative behavior scales with flow shear. The mechanism of action is that shear distortion enhances the fragmentation of cooperative clusters, thereby increasing the group fragmentation rate and limiting the spread of cheaters. 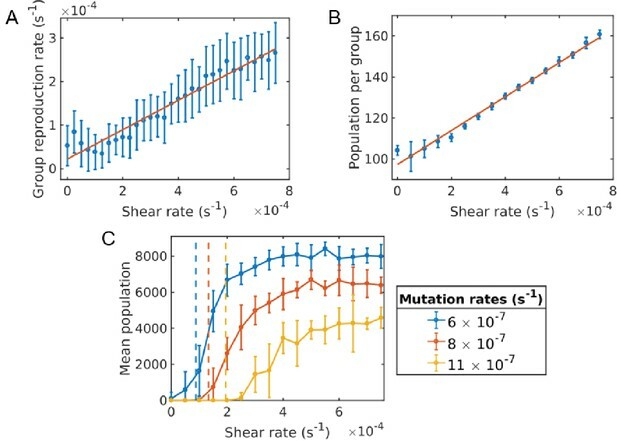 If the shear is large enough that groups are torn apart at a larger rate than the mutation rate, then cooperation will prevail. Otherwise, groups will become dominated by cheaters, and eventually die out (Figure 2, Videos 1–3). 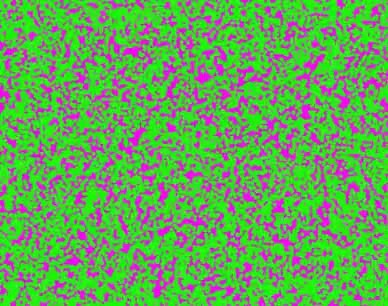 This is a video file of a simulation of the homogeneous phase. This is a video file of a simulation of the group phase. This is a video file of a simulation of the group phase under Couette flow. We study a physically realistic spatial model of microorganisms, where fluid dynamical forces contribute significantly to the evolution of their social behavior. Our analysis consists of simulations and analytical formulas. We simulate microbes as discrete particles subject to stochastic physical and evolutionary forces, and the compounds secreted by microbes as continuous fields. In contrast, our analytical expressions are derived from analogous equations that are entirely continuous and deterministic. In general, we should not expect the discrete simulations to perfectly be described by the continuous set of partial differential equations. Nevertheless, the continuous system of equations do allow us to obtain relevant quantities such as group size and group fragmentation rate to a good approximation (cf. appendix 1 and Figure 3). Here n is a shorthand for n(x,t,s1), the number density of microbes at time t and position x that produce the public good at a rate of s1. These microbes pay a fitness cost of β1s1 per unit time. The production rate of waste s2 on the other hand, is assumed constant for all, and has no fitness cost. Waste limits the number of individuals that a unit volume can carry. Microbes secreting public goods at a rate s1 replicate to produce others with the same secretion rate. This reproduction rate is given by the square bracket. However, the production rate s1 can change due to mutations. This is described by the last term of Equation 1. Mutations can be thought as diffusion in s1 space. The microbes secrete two types of molecules into the environment. The first, a beneficial public good that promotes growth, and the second, a waste or harmful substance hinders growth. Cheating microbes produce lessor none of the former, while benefiting from public goods secreted by the altruistic population. In all three equations the first two terms describe diffusion and advection, while the last two terms of Equation 2 and Equation 3 describe the production and decay of chemicals. The first two terms in the square bracket describe the effect of the secreted compounds on fitness. This saturating form is experimentally established and well understood (Monod, 1949). The crucial third term in the square bracket describes the cost of producing the public good, which increases linearly. 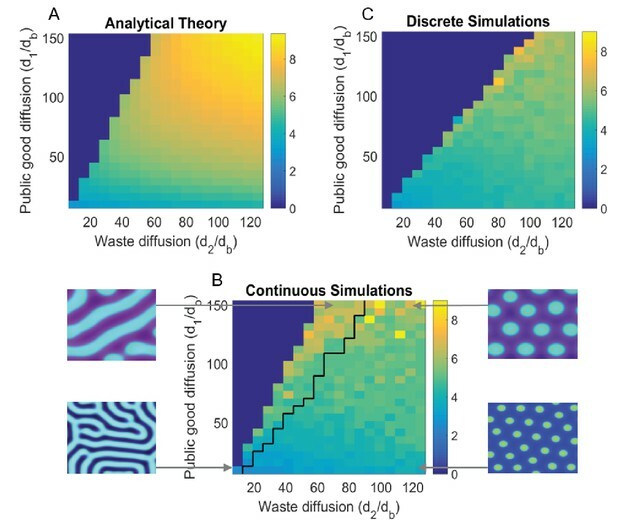 Diffusion can cause an instability that leads to the formation of intriguing patterns (Turing, 1990), which among other fields, have been investigated in ecological context (Tian et al., 2011; Camara, 2011; Baurmann et al., 2007; Wilson et al., 2003). These so called Turing patterns typically form when an inhibiting agent has a diffusion length greater than that of an activating agent. For our model system, the waste compound and public good play the role of inhibiting and activating agents, and patterns manifest as cooperating microbial clusters Figure 2. The size and reproduction rate of these clusters, in terms of system parameters, can be estimated from a Turing analysis (cf. appendix 1). 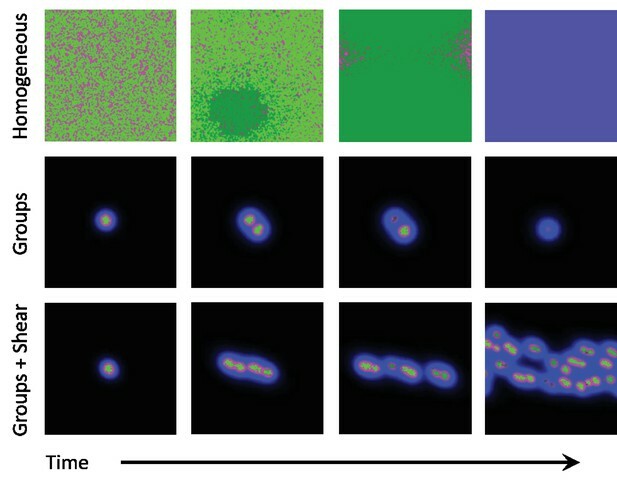 Figure 3 shows the values of diffusion constants that gives rise to Turing patterns, as well as the size of the groups. Snapshots of homogeneous and group phases without and with shear. Microbes interact by secreting diffusive chemicals into their environment. 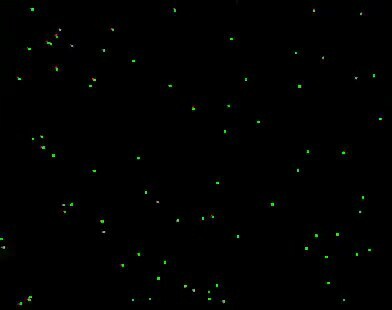 Cooperators are seen as bright green dots, and cheaters are seen as dark green dots. The waste compound is shown as blue and the public good as red, the two combined is seen as magenta. Top row: In the homogeneous phase the microbes spread to fill the domain. Cheaters quickly begin to take over, and eventually take over the whole domain. With no cooperators left, the public good decays away and the system goes extinct. Middle row: In the group phase, when the diffusion length of the waste compound is larger than the diffusion length of public good, microbes form stable groups. As the microbes increase in number, the groups split apart and form new groups. As mutations occur within groups, the cheaters take over and the group goes extinct. Cooperation can only be stable here if groups reproduce quicker than mutants take over. Bottom row: By adding a shearing flow to the group system, we can cause the groups to split apart quicker. Mutations still take over groups, but the groups are able to reproduce quicker than mutants take over, thus allowing cooperative groups to prevail at steady state. The simulation videos corresponding to this figure are provided in the Videos 1–3. The top-left figure, (A) shows the group size 2π/kfast as obtained by our theoretical analysis (appendix); whereas the bottom figure, (B) shows the same for continuous simulations, and the top-right figure, (C) is for agent based simulations. The black line in (B) divides parameters that give rise to striped patterns, and those that give rise to spots, corresponding images are shown to the left and right of (B). Due to the discreteness of the agent based simulations, Turing patterns are not always stable where they might be in the continuous analogue. We see that the discrete simulations cut off around where we would see stripes in the continuous case, and do not see striped patterns in the discrete case. For different sets of parameters, we can also see Turing patterns in the discrete-stochastic case where they might not occur in the continuous case. For the region where Turing patterns are stable, the continuous theory gives a good prediction of group size and group reproduction rate. The Matlab code and data for this figure is provided in Figure 3—source data 1. In the homogeneous phase, the system is evolutionarily very unstable, since as soon as one cheating mutant emerges, it quickly takes over the entire population, ultimately causing the population to go extinct (Video 1). The group phase tolerates cheaters better, since once a cheater emerges it will take over and compromise the fitness of only one group, while the others will live on. However, in the absence of group fragmentation, novel cheating mutations will ultimately emerge in all groups, and annihilate the population one group at a time (Video 2). The main contribution of this paper is to demonstrate that stable social cooperation can be induced or enhanced by fluid flow gradients. Specifically, shear forces induced by advective flow distorts and fragments microbial clusters, leading to a kind of budding dispersal, which in turn enables evolutionary stable cooperation (Figure 2, Video 3). It is well known that evolutionary outcomes can depend on individuals being discrete (Durrett and Levin, 1994). In our model, having a continuous population density can allow for the existence of ‘micro-mutant populations’ which can spread easier between adjacent groups. The discreteness further separates the clusters of microbes from each other, since there cannot exist fractional individuals. In reality microbes are quantized, and we thus expect a discrete simulation to better model the biology. In Figure 3 we present the phase diagram of the system, as obtained by analytical theory, discrete agent based simulations (where microbes are discrete, self-replicating brownian particles), and continuous simulations (where Equations 1,2,3 are solved numerically). In order not to obfuscate the biology, we report our detailed mathematical treatment in the appendix. We quantitatively determine the effect of different flow velocity profiles on the social evolution of the system. A constant fluid flow merely amounts to a change in reference frame, which of course, does not change the evolutionary fate of the population. However, we find that velocity gradients cause significant changes to the social structure, both spatially and temporally. Specifically, we find that large shear rate causes microbial groups to distort and fragment, which in turn facilitates group reproduction. To investigate this effect in detail, we ran simulations for three fluid velocity distributions: Couette flow, Hagen-Poiseuille flow, and Rankine vortex. 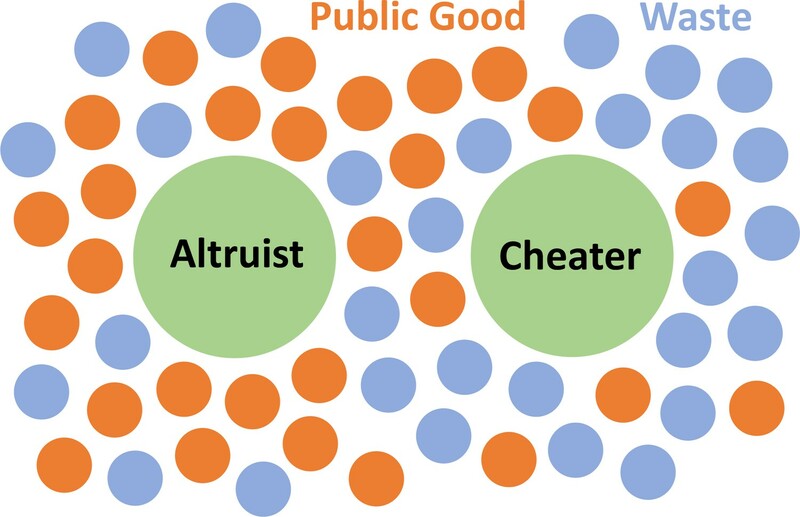 We first look at a simplified system with just two phenotypes, cheater and altruist, to gain a basic understanding of the mechanism involved. Mutations can cause a switch in social behavior. where R is the radius of the pipe, and z^ is the longitudinal direction. We ran simulations for various shear rates and diffusion constants and observed that shear does not significantly influence the region of parameter space that gives rise to cooperating groups. However if the system parameters are conducive to the formation of groups, shear tears groups apart and increases the rate at which spatially distinct cooperative clusters form. where ω0 is the fragmentation rate solely due to microbial diffusion and can approximately be given by the Turing eigenvalue ω0≈Λmax (see appendix). The constant of proportionality m is given empirically from our simulations and depends on diffusion lengths and group density. This holds in the low density regime. Once the population density becomes large, group-group interactions slow the group reproduction rate and the population saturates. Critical shear for cooperativity for cheater-altruist system. (A) Group fragmentation rate versus shear rate. We see that the group fragmentation rate increases linearly with the shear rate. (B) Group population versus shear rate. As the shear distorts and elongates the group, the average group population also increases linearly with shear. (C) Average population versus shear rate for different mutation rates. Simulations were run for a time of 5.0×105 s and averaged over 10 runs for each shear rate and mutation rate. Error bars correspond to one standard deviation. Here, a mutation corresponds to a full cheater, with no public good secretion. The population goes extinct under larger mutation rates unless the shear rate is above the critical value. The critical shear values for different mutation rates are roughly obtained by 10 and are shown by the vertical dashed lines corresponding to curves of the same color. The Matlab code and data for this figure is provided in Figure 4—source data 1.
where n and N0 are the slope and intercept of the line in Figure 4B. This also influences where the critical shear rate will be. The values obtained from Equation 5 is indicated by the vertical dashed lines in Figure 4 and agrees with the computationally observed critical shear reasonably well. It may be possible to improve this formula further by taking into account additional factors, such as the non-uniform spatial distribution of population within a group and the elongation of groups with shear. Furthermore, as the mutants increase in numbers it becomes more likely that one of them crosses over the daughter group, thereby reducing further the expected <τd>. We see better agreement with analytical theory and simulations at lower mutation rates, since these corrections are mainly to the diffusion time <τd>, and become more significant at higher mutation rates, where <τd>≫1/μN, (cf. Equation 4). If shear is below the critical value (Equation 5), the system will be in a non-social state. Ultimately, cheaters will take over, and wipe out all groups. When shear is increased above the critical value however, the system will transition to a stable social state, thereby maintaining its fitness and dense population indefinitely. Figure 4 shows the long-time population of the system versus the shear rate. The population goes extinct under larger mutation rates unless the shear rate is above the critical value. When is shear necessary, and when is it just a sufficient condition for cooperation? By setting σc=0 in Equation 5 and solving for μ we can also obtain the critical mutation rate above which shear is necessary in order to have social cooperation. We get μc=6.9×10−7 analytically and our simulations show a critical mutation rate around μc=5.5×10−7. As we will see, we obtain similar results when the available phenotypes include a continuum of social behaviors. In this case, a mutation changes the secretion rate of a microbe by a uniformly chosen random number between 0 and 1 s−1. We observe from our simulations, that mutations that increase the secretion rate of a microbe do not fixate, since the microbe now pays a higher cost and is less fit than its neighbors. However, once a mutation that lowers the secretion rate of a microbe occurs within a group, it quickly takes over the entire group, leaving individual groups homogeneous in secretion rate. We show the diversity of social behaviors across groups and within individual groups in greater detail in Appendix 1—figure 1. Since less cooperative phenotypes always dominate more cooperative phenotypes, we find no diversity of social behavior within a group. However we do see a large variation across groups, which increases with shear. Groups with different secretion rates reproduce at different rates. Groups with too low of a secretion rate are not stable and die off. In general, the system will evolve to a distribution of groups with secretion rates centered around the value of secretion rate that maximizes the group reproduction. For larger mutation rates, the system will tend towards lower average secretion rate and/or go extinct. The average secretion rate of the population can be maintained at a higher value by introducing shear flow, Figure 5. Evolution of sociality in constant shear (continuum of secretion rates). Individual groups are essentially homogeneous in secretion space, whereas the meta-population contains a distribution of groups with different secretion rates (Appendix 1—figure 1). (A) Groups that have a higher secretion rate reproduce quicker than those of lower secretion rate. Shear works to increase the reproduction rate of groups. (B) Just as in the two phenotype case, the population of the system increases with shear, since groups are able to split apart quicker than novel cheating mutations occur. (C) The average secretion rate of the entire population generally increases with shear and saturates around where the group reproduction rate is sufficient to maintain the population. Simulations were run for a time of 2.0×105 s and averaged over 80 runs for each shear rate and under a mutation rate of μ=1.6×10−6s−1. Error bars correspond to one standard deviation. The Matlab code and data for this figure is provided in Figure 5—source data 1. We therefore have the same qualitative result as in the two phenotype case, if shear is below some critical value, the system will be in a non-social state. Ultimately, cheaters will take over, and wipe out all groups. As before, the social state of the population can transition from a non-cooperative state to a cooperative one with increased flow shear. We therefore expect to see groups fragment quicker at the boundary, leading to larger cooperation, higher average secretion rate, and larger population, which is indeed what we do see (Figure 6, Video 4). Evolution of sociality in pipe and vortex geometries (continuum of secretion rates). The top row gives simulation snapshots of the system in a Hagen-Poiseuille flow in a pipe (A) and of the system in a Rankine vortex (B). The middle row gives the average microbial population and the shear rate magnitude versus distance from the center of the pipe (C) and the center of the Rankine vortex (D). Since shear is spatially dependent, the population is localized in regions of large shear. For Hagen-Poiseuille flow, we see that the population is larger at the boundaries, where the shear is also larger (C). This is because groups fragment quicker at the boundaries and are able to overcome take-over by mutation, whereas near the center they cannot. For the Rankine vortex we also see that the population follows very closely to the shear (D), which suggests that the growth is proportional to shear. We caution that this holds in the low density limit. At higher densities the population saturates and is no longer proportional to shear. The bottom row gives the average public good secretion rates of the entire population for Hagen-Poiseuille flow (E) and for Rankine vortex flow (F). 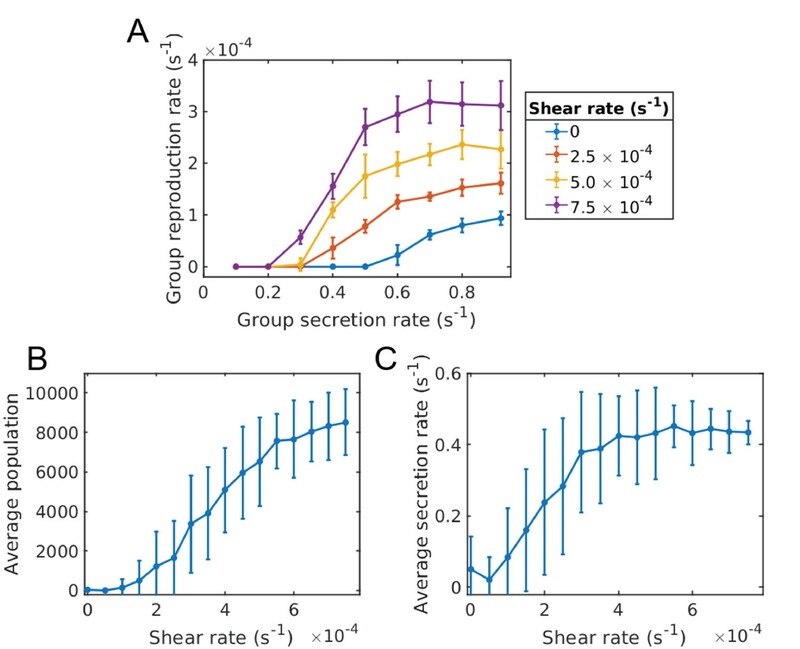 Again, regions of larger shear admit more cooperative populations with larger public good secretion rates. Simulations were run for a duration of 2.0×105 s under a mutation rate of μ=2×10−6s−1 and data was averaged over 200 runs. The undulations observed in the population plots are due to the finite size of the groups. Groups form layers of width equal to the group diameter. The population curve therefore shows undulations of width equal to the group width. Simulation videos of Hagen-Poiseuille flow and Rankine vortex flow are provided in Videos 4, 5 and Matlab code and data for (C)-(F) is given in Figure 6—source data 1. This is a video file of a simulation of the group phase under a Hagen-Poiseuille flow. Earlier studies have proposed and shown that shear trapping due to the interaction between bacterial motility and fluid shear can result in preferential attachment to surfaces, (Rusconi et al., 2014; Berke et al., 2008; Li et al., 2011). In a similar spirit, we suggest that inhabiting surfaces may have the additional advantage of enhanced sociality, due to shear driven group fragmentation and dispersal. In a vortex, the region above the critical shear value constitutes an annulus. Thus, we expect social behavior to be localized. Any point in the fluid outside this annulus will be taken over and destroyed by cheaters. In our simulations, at steady state we indeed see clusters whirling around exclusively within annulus, neither too near, nor too far from the vortex core (Video 5). Life cannot exist outside this annulus, as cheaters kill these groups. This is a video file of a simulation of the group phase under a Rankine vortex flow. The shear rate is then a maximum at the minimum value of r which occurs at the vortex radius R. We therefore expect to see the largest concentration of groups at the vortex radius, which is what we observe in our simulations (Figure 6). While we paid close attention to physical realism, we also made important simplifying assumptions which under certain circumstances, may lead to incorrect conclusions. We caution the reader by enumerating the limitations of our model. First, since many microorganisms live in a low Reynolds number environment, we have chosen to neglect the inertia of microorganisms. However in reality, the microorganisms influence the flow around them. This effect will be particularly significant for a dense microbial population, especially when the microbes stick onto one other, or integrate via extracellular polymers. A more sophisticated model would include the coupling of the microbes to the flow. Secondly, the finite size and shapes of the microorganisms have been neglected. Instead, we have treated microbes as point particles, which will also invalidate our model in the dense population limit. Lastly, real microbes display a large number of complex behaviors such as biofilm formation and chemotactic migration. Here we have ignored the active response of microorganisms to the chemical gradients that surround them and to the surfaces they might attach and migrate. 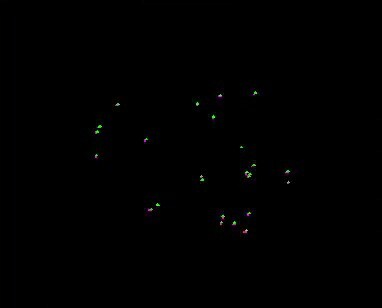 Instead, we took them as simple Brownian particles. It is well known that spatial structure is crucial in the evolution of cooperation, (Wilson et al., 1992; Taylor, 1992; Lion and Baalen, 2008). Many of these studies introduce these mechanisms ‘manually’, for example density regulation and migration are enforced by applying carrying capacities and migration rates to groups. In this study we have distanced ourselves from the typical game theoretic abstractions used to investigate evolution of cooperation. Instead we adopted a mechanical point of view. We investigated in detail, the fluid dynamical forces between microbes and their secretions, to understand how cooperation evolves among a population of planktonic microbes inhabiting in a flowing medium. In our first principles model, the spatial structuring and dispersion occur naturally from the physical dynamics. We found that under certain conditions, microbes naturally form social communities, which then procreate new social communities of the same structure. More importantly, we discovered that regions of a fluid with large shear can enhance the formation of such social structures. The mechanism behind this effect is that fluid shear distorts and tears apart microbial clusters, thereby limiting the spread of cheating mutants. Our proposed mechanism can be seen as shear flow enhanced budding dispersal. This can also be viewed under the phenomenon of Simpson’s paradox (Chuang et al., 2009) where individual groups may decrease in sociality, but the population as a whole becomes more social. In our investigation, we found only certain regions of the fluid domain admits life, social or otherwise, as governed by the domain geometry and flow rate. From this perspective, it appears that evolution of sociality is a mechanical phenomenon. In our physics-based model, groups emerge from individual-level dynamics and selection. Groups with cheaters are negatively selected, and give way to those without cheaters. On the other hand the ensemble of groups do not exhibit any variation in their propensity to progenerate cheaters, neither is such propensity heritable. Rather, the progeneration of cheating is a (non-genetic) symptom that inevitably manifests in every group that has been around long enough. In this sense, it might be appropriate to view the emergence and spread of cheaters in a microbial population as a phenomenon of ‘aging’, in the non-evolutionary and mechanical sense, that any system consisting of a large number of interdependent components will inevitably and with increasing likelihood, fall apart (Vural et al., 2014). The analytical conclusions we derive from our system (Equations 1,2,3) has been guided and supplemented by an agent based stochastic simulation. Videos of simulations are provided in Videos 1–5. Our simulation algorithm is as follows: at each time interval, Δt, the microbes (1) diffuse by Brownian motion, with step size δ derived from the diffusion constant and a bias dependent on the flow velocity, δ=4dbΔt+vΔt, (2) secrete chemicals locally that then diffuse and advect using a finite difference scheme, and (3) reproduce or die with a probability dependent on their local fitness given by f=Δt[ α1c1c1+k1−α2c2c2+k2−β1s1 ]. If f is negative, the microbes die with probability 1, if f is between 0 and 1 they reproduce with probability f, and if f is larger than 1, they produce number of offspring given by the integer part of f and another with probability given by the decimal part of f. Upon reproduction, random mutations may alter the secretion rate of the public good –and thus the reproduction rate– of the microbes. Mutations occur with probability μ and can change the secretion rate by a random number between 0 and s1. The secretion rate is assumed to be heritable, and constant in time. Numerical simulations for figures were performed by implementing the model described above using the Matlab programming language and simulated using Matlab (Mathworks, Inc.). The source code for discrete simulations is provided in Source code 1 and the source code for continuous simulations used in Figure 3B is provided in Source code 2. A summary of the system parameters is given in Table 1, along with typical ranges for their values used in the simulations. The relevant ratios of parameters are consistent with those observed experimentally (Kim, 1996; Ma et al., 2005). Here we describe a number of simplifying assumptions and following mathematical analysis that allow us to make sense of our simulation results, both qualitatively and quantitatively. Our approach is the standard Turing analysis commonly used to describe pattern formation in reaction diffusion systems. We first obtain a steady state solution, that is find out the population density and concentration of the public good and waste compound that leads to an equilibrium state. We then linearize the system around this equilibrium, and find out what kind of perturbations destabilize this equilibrium. The spotty patterns that form upon destabilization biologically correspond to cooperating microbial communities, the size of which we obtain in terms of system parameters. Our analytical outcomes are compared to discrete simulations in Figure 3. Our simulations start with the whole population having a given secretion rate. The Turing analysis conducted below is then to find the group size and reproduction rate with this secretion rate. 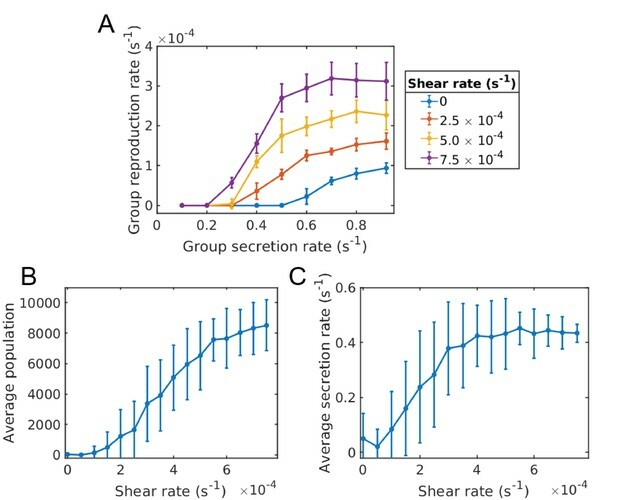 Secretion rate distributions of groups under different shear rates. Microbes are grouped by their position in space and the distribution of their secretion rates is plotted. Simulations were started with a secretion rate of 100 and random mutations were allowed to change the secretion rate of individual microbes. Distributions are given by looking at 10 simulations for each shear rate after a duration of 2.0×105 s. (A) With no shear, there are very few groups left at the chosen time and these will eventually go extinct. Cheaters have taken over these groups and individual groups are homogeneous in secretion rate. (B) With some added shear, groups are better able to beat cheating mutations, but the bulk of the distribution is still at lower secretion rates. (C) At higher shear rates there are more groups centered at a higher secretion rate due to shear augmented group fragmentation. In all cases, groups that initially start off with a heterogeneous population quickly become homogeneous, as seen by the delta peaks in the distributions. Each peak corresponds to a group. In the larger population however, groups of different secretion rates can and do coexist, as seen by the distribution of the peaks. In this case we can still analyze individual groups by looking at their secretion rate. The Matlab code and data for this figure is provided in Appendix 1—figure 1—source data 1. We also observe in our simulations, that groups are typically homogeneous in terms of secretion rate; that is once a cheating mutation occurs in a group, it fixates and quickly takes over the group, on a time scale much quicker than the group fragmentation (Appendix 1—figure 1). In other words, while the populations in different groups may have different secretion rates, the secretion rate within one group is approximately uniform. We can therefore simplify our equations to determine the spatial structure of a group in terms of the secretion rate of its constituents, even after mutations occur. To determine the native group size and reproduction rate (i.e. when there is no shear and mutation) we can now write down a simplified set of equations,. where a=(α1−α2−β1s1)s1s2,b=α1s1−α2s2−β1s1(s1+s2), and c=−β1s1. For this to be a sensible solution, we require n∗ to be real and positive. This also imposes conditions on the system parameters. (22) Ψ(k2)=d1d2k6+[ d1σ+d2 ]k4+[ σ−d2f1s1−d1f2s2σ ]k2. where ak=3d1d2,bk=2[d1σ+d2], and ck=σ−d2f1s1−d1f2s2σ. We take the positive root in 33 corresponding to the physical, positive k2. For all combinations of parameters giving rise to stable groups, we observe in our simulations that the group size approximated well by 2π/kfast, where, kfast is the wave number corresponding to the fastest growing mode (i.e. the value that maximizes Λ(k2)). The size of the microbial clusters, as obtained by analytical theory 2π/kfast and stochastic simulations are shown in the top row of 3. The color indicates the size of microbialgroups. Roughly speaking, if we view a microbial cluster as the cause of perturbation at a nearby location, the Turing instability will manifest as group reproduction. We should strongly caution that as the instability proceeds, the system moves away from the initial unstable fixed point around which it was linearized, and thus the exponential dependence in 24 should eventually break down. Nevertheless, the eigenvalues in the exponents still provide us with an approximate estimation of the group reproduction rate, within a factor of two near the phase boundary. Journal of Theoretical Biology 245:220–229. Nonlinear Analysis: Real World Applications 12:2511–2528. Journal of Evolutionary Biology 27:1869–1877. Proceedings of the Royal Society B: Biological Sciences 276:13–19. Journal of Evolutionary Biology 19:1707–1716. Journal of Evolutionary Biology 28:305–319. Journal of Evolutionary Biology 28:1734–1746. London, New York: Green and Co.
Korean Journal of Chemical Engineering 13:282–287. Kin and multilevel selection in social evolution: a never-ending controversy? Trends in Ecology & Evolution 26:193–201. Journal of Chemical & Engineering Data 50:1192–1196. Physica A: Statistical Mechanics and Its Applications 282:283–303. Proceedings of the Royal Society B: Biological Sciences 280:20122770. Microbiology and Molecular Biology Reviews 68:345–361. The Quarterly Review of Biology 79:135–160. Journal of Theoretical Biology 299:55–63. Nonlinear Analysis: Real World Applications 12:3224–3237. Bulletin of Mathematical Biology 52:153–197. Journal of the Royal Society Interface 12:20150044. Journal of Evolutionary Biology 20:415–432. Can altruism evolve in purely viscous populations? Behavioral and Brain Sciences 17:585–608. New York: Hafner Publishing Co. Thank you for submitting your work entitled "Shearing in flow environment promotes evolution of social behavior in microbial populations" for consideration by eLife. Your article has been evaluated by a Senior Editor and three reviewers, one of whom, Jeff Gore (Reviewer #3), served as Reviewing Editor. Our decision has been reached after consultation between the reviewers. The referees appreciated that the study allows for a principled way of thinking about how spatial structure could arise. However, there were several significant concerns that were expressed regarding the presentation, conceptual framing, and technical implementation of the model. We do believe that the approach has potential, so if you can address all the concerns of the referees, we would consider a new manuscript. * Does the social strain actually evolve / spread in the model? The manuscripts considers the problem of how cooperation survives in the presence of cheaters. The explanation is based on the Simpson's paradox (paper by Stan Leibler is not cited and the mechanism is not discussed). The novelty is that the metacommunity dynamics emerge from the governing equations rather than being externally imposed. Specifically, the production of public good and waste are set up to produce a Turing instability, which creates patches of high population density separated by voids. These act as local communities in a meta community. Within each patch cooperators are outcompeted, but patches with many cooperators grow faster than patches with few cooperators. As a result, cooperators persist. The key factor in the above argument is that the competition occurs between different patches. It seems to me that, for this to happen, the patches need to be constantly reformed. Reforming could occur due to breaking of the Turing patters by the flow. I think this mechanism is very important, but it is not discussed in the manuscript in any detail. Instead, a lot of the Discussion is focused on the enhancement of the cluster growth rate due to flow. While this enhancement plays a role, it is not clear whether this or the above mechanism is the dominant force. This seems to be a major point to address. Other comments. The first half of the paper restates the standard results from Turing pattern formation and is better suited for Supplementary Information. I don't think these derivations are necessary to understand the main results and will probably be skipped by most readers. The simulation methods need to be better discussed. The following paper could also be relevant, Drescher, Knut, et al., 2014. 1) Simpson's paradox is pretty well established. 2) Turing patterns are known to occur in ecological models and possibly real ecosystems. The fact that inhomogeneous spatial densities due to Turing patterns affect species interactions is also well known. There is a lot of literature on this. See for example Wilson, Morris and Bronstein, 2003. 3) It is not clear whether the specific model is applicable to any specific ecosystem or that the Turing mechanism is robust and present in actual microbial communities. In this paper, the authors show that advection in the spatial population dynamics of microbes can lead to the assortment that is necessary to maintain cooperation (in the form of public good production). This is potentially interesting, but I find the background and Introduction of the paper conceptually flawed. Moreover, the basic model seems to contain an error. For me, the conceptual problems start with the first sentence of the Abstract: "It is advantageous for microbes to form social aggregates when they commonly benefit from secreting a public good." This is the wrong premise: whether it is advantageous to form groups is a question, not a fact. Similarly, in the Introduction the authors state: "… until the lack of public goods compromise the fitness of the entire group". This sounds like it is already known how this plays out, but that's exactly the problem: it is generally not known how this plays out. The way the authors are stating this, the outcome would be a matter of the relative strength of individual vs. group selection. However, despite the fact that they are vaguely referring to "group fitness" and "species fitness" throughout the paper, their model does not have reproducing groups, and hence they are not talking about group selection (see also below). In fact, they are talking about individual selection, and in particular they are talking about a particular mechanisms, advection, that can lead to assortment of cooperative types and thereby the maintenance of cooperation. In general, the Introduction doesn't make much conceptual sense to me. For example, I don't see how quorum sensing falls into the category of mechanism where altruism is a consequence of a self-serving trait. With quorum sensing, the problem is shifted onto the production of the sensing signal, which becomes itself a public good. Judging from the literature cited, the authors do not seem to be up to date with group selection theory: Simon et al., 2012, 2013 have shown that kin selection is not closely linked to kin selection, as claimed by the authors in the third paragraph of the Introduction. Group selection is an altogether different mechanism than selection at the individual level, of which kin selection is an example. In general, all individual-level explanations for cooperation, including kin selection, can be understood on the basis of assortment (Fletcher and Doebeli 2009). Group selection is a conceptually different mechanism that involves differential birth and death of groups with different type compositions, as well as (possibly) interactions between groups (Simon et al., 2013). In particular, it seems clear that the mechanism for the evolution of cooperation proposed by the authors is an example of (spatial) assortment, and not of group selection as they claim. They mention that in their model, spatial groups form and "reproduce", but this is simply an emergent property of the model, and the significance of the differential reproductive success of different groups is not investigated in the paper. My guess is that even if these "groups" would not reproduce, cooperation would still be maintained due to the assortment caused by advection. Overall, it is therefore not clear that the authors fully understand the conceptual underpinnings of the evolution of cooperation, and how their model fits with existing theory and concepts. Perhaps more importantly, I think the basic model 1-3 may contain a fundamental flaw. Specifically, in Equation 2 the term -ns1 does not seem to make sense, since this represents only the public good produced by those microbes whose cooperation level is s1. This term should be replaced by an integral over s1, thus measuring the contribution to the public good of all types. Similarly, the term -ns2 in Equation 3 seems wrong, as here the term n should be replaced by an integral over all types s1, i.e., n should be replaced by the total number of all microbes living at a given location. (Note that the model does not assume only a single type s1 at any given location; otherwise the second derivative with respect to s1 in Equation 1, i.e., diffusion in s1 space, would not make sense.) Given that the basic equations may be wrong, I am uneasy about the rest of the analysis in the paper. Overall, I found this to be an intriguing combination of two rather different fields. As the authors describe, there is a long history of theory and experiment probing the conditions required for the evolution of cooperative behaviors, and some of this work has focused on spatial structure. However, little of the work has considered interesting flow fields with shear. I very much like the idea of a public good and a public bad, each of which is secreted. Then, if the public bad diffuses faster than the public good it is possible to have Turing instabilities. My primary concern is that I didn't understand how the dynamics between cooperation and cheating took place in terms of distribution and abundance of the different strategies. How much cooperation was present in the various flow situations? Was there heterogeneity in the population? What would happen if there were a (non-evolving) fixed cooperator and another genetic cheater? Two of the three reviewers are still uncomfortable with your treatment of heterogeneity in the population. Even if a cheater will quickly take over a local population, it does not mean that there cannot be heterogeneity of different levels of cooperation within each local population or within the broader metapopulation, where different groups could have different levels of cooperation. As far as we can tell, this sort of heterogeneity was never analyzed in the paper, but we think that it is very important for a complete understanding of the system. As indicated below in more detail, this is not simply a question of "notation." It seems that the integral was added into the model description but that no analysis of this heterogeneity was actually done. 1] The authors state that "It is well known that evolution of altruism in species strongly depends on the individuals being discrete (Durrett and Levin (1994)). This would seem to imply that deterministic models, e.g. involving differential equations for frequencies of different types, would never lead to cooperation, which is of course not true. Furthermore, the argument in Simon et al. (2012) for why group selection is different from kin selection is not primarily based on the asynchrony of individual-level and group-level events. Rather, it is a consequence of the fact that assortment (or, equivalently, relatedness) may have no influence on certain group level events, such as games between groups. 2] The authors' statement in the rebuttal letter that "This change in notation does not affect our results or analysis, since in our simulations we start the population with a fixed secretion rate." is unclear to us. First, starting with a fixed secretion rate would not make the original equations correct, because mutation would quickly lead to a situation in which secretion rates are variable. Second, what is meant by "a change in notation does not affect our results"? Of course, a change in notation does not affect anything, apart from the notation in itself. The question is whether the simulations were carried out correctly, i.e., with the integral (summation) term taken into account. Have the simulations been carried out according to the new, correct equations? 3] The authors' finding that without advection, cooperation cannot be maintained in their system is curious. This seems contrary to previous work by Hauert and colleagues (Wakano et al., 2009), which shows that cooperation is maintained in public goods reaction-diffusion systems. I am wondering about the cause of the different outcomes in these models. Is it due to the continuous nature of the secretion trait considered in the present study? If so, this might be important to point out in the Discussion. We have now added a reference to Stan Leibler’s paper  in the Introduction and final discussion citing that our results also fall under the broad phenomenon of Simpson’s paradox (Introduction, eleventh paragraph, Discussion, second paragraph). We have now added more discussion to clarify that it is indeed the shear driven group fragmentation that promotes sociality, and not the growth rate of the clusters (subsection “Social groups as Turing patterns”). We have also modified Figure 2 to better illustrate the main mechanism, and have included videos of our simulations in Supplementary files 1-5. Also, Figure 4A shows that group fragmentation rate increases with shear. We have now moved the mathematical details to an appendix to help clarify the biological results. We have added more detail in the Materials and methods section (fourth paragraph) explaining our simulation methods. We have also added a reference to Drescher’s paper  (Introduction, seventh paragraph). Regarding the “distracting factors” mentioned above, we agree that Simpson’s paradox and Turing patterns in nature are well known. We now emphasize in the paper, that the novelty is not in the Turing mechanism. This is our starting point (Introduction, eleventh paragraph). We now clarify in the paper that the novel aspect of our work is the effect of fluid shear on spatial assortment and on the evolution of cooperation (Introduction, twelfth paragraph). We’ve also added reference to Wilson’s paper  (Introduction, eleventh paragraph and subsection “Social groups as Turing patterns”, first paragraph) as well as references to studies finding growth patterns in microbial systems [4,5]. As for point number three: We would be very excited to see experimental verification of our fluid dynamical model in specific aquatic niches. We now emphasize that we have built our model and chosen parameter values (e.g. diffusion constants, decay rates, flow velocities etc.) from well-established results (Materials and methods, third and last paragraphs) that would generalize to a wide range of systems (Introduction, tenth paragraph). Hopefully this generality will inspire experimentalists to look for the phenomenon we reported. 1] Chuang, John S., Olivier Rivoire, and Stanislas Leibler. "Simpson's paradox in a synthetic microbial system." Science323.5911 (2009): 272-275. 2] Drescher, Knut, et al. "Solutions to the public goods dilemma in bacterial biofilms." Current Biology 24.1 (2014): 50-55. 3] Wilson, W. G., W. F. Morris, and J. L. Bronstein. "Coexistence of mutualists and exploiters on spatial landscapes." Ecological monographs 73.3 (2003): 397-413. 4] Ben-Jacob, Eshel, et al. "Generic modelling of cooperative growth patterns in bacterial colonies." Nature 368.6466 (1994): 46-49. 5] Chang-Li, Xie, et al. "Microcalorimetric study of bacterial growth." Thermochimica Acta 123 (1988): 33-41. We have now changed the Abstract to state that the general question is how microbes maintain cooperative behavior. Additionally, we state (subsection “Social groups as Turing patterns”) that one way to maintain this behavior is through forming social groups. In our model, without this spatial structuring, the population does get taken over by cheaters. We have also modified Figure 2 to illustrate this phenomenon in a clearer way. We have also included videos of simulations in the different scenarios in Supplementary files 1-5. We clarify that we indeed have reproducing and dying groups in our system, these are emergent phenomena from the individual level dynamics, this is evident from (Equations 6, 9, 10) and also, Figure 4A gives the group reproduction rate as a function of shear. To clarify this, we have also added some more discussion (Introduction, eleventh paragraph and subsection “Social groups as Turing patterns”). Also, we have now modified Figure 2 to explicitly show how shear driven group fragmentation enhances cooperation. The videos included in the supplementary files also illustrate this. Hopefully this should greatly clarify our main finding. In general, the Introduction doesn't make much conceptual sense to me. For example, I don't see how quorum sensing falls into the category of mechanism where altruism is a consequence of a self-serving trait. With quorum sensing, the problem is shifted onto the production of the sensing signal, which becomes itself a public good. We have clarified this discussion to explain how quorum sensing can be an example of reciprocity (Introduction, third paragraph); the cited paper by Allen 2016, discusses this phenomenon. Judging from the literature cited, the authors do not seem to be up to date with group selection theory: Simon et al., 2012, 2013 have shown that kin selection is not closely linked to kin selection, as claimed by the authors in the third paragraph of the Introduction. The review by Kramer  shows that this is still not a settled discussion. The model proposed by Simon [2, 3] makes an interesting point that since individual and group level selection are asynchronous in nature, they cannot be equivalent. We agree that according to the definition given by , group selection is different from kin selection, though there is still some debate on this [1, 4-6]. Nevertheless, we agree that our mechanism can be better described by individual level selection, and rather than muddle the discussion with group selection, we have changed our discussion throughout from group selection to individual selection and spatial assortment. Indeed, the fluid dynamical / diffusion equations on which the simulations are based on describes the growth and evolution of individual microbes, and not of groups. We therefore change our discussion to now focus on assortment that arises from population viscosity and budding dispersal, which, in our case, emerges from the Turing instability. We clarify this further with discussion (Introduction, fourth and fifth paragraphs) and have added references to Simon [2, 3] as well as Fletcher and Doebeli . We also emphasize that cooperation would not be maintained without group fragmentation. Advection only enhances the group fragmentation, whereas the spatial isolation of microbial groups caused by the Turing instability is what allows for cooperation to persist (subsection “Social groups as Turing patterns”). We have now modified Figure 2 to illustrate this. The referee is correct. The old version of the equation did not notate the continuum of possible secretion rates. We have now changed the equations of the model in the Materials and methods section, where our notation now accounts for a continuum of possible secretion rates. This change in notation does not affect our results or analysis, since in our simulations we start the population with a fixed secretion rate. The Turing analysis conducted in the paper is to find the native group size and reproduction rate with this secretion rate. We also observe in our simulations that groups are typically homogeneous in terms of secretion rate; i.e. once a cheating mutation occurs in a group, it fixates and quickly takes over the group, on a time scale much quicker than the group fragmentation. Therefore, this simplification is also applicable after mutations occur. To better clarify our analysis, we have now moved the mathematical analysis into the appendix. We have added discussion in the first section of the appendix on how we can make some simplifying assumptions to the model to analyze homogenous groups (Appendix 1, first to fourth paragraphs). We also better clarify our simulation methods and acknowledge that we do not expect perfect agreement between the stochastic-discrete simulations and the continuous equations, although we were able to obtain the relevant quantities such as group size and reproduction rate, to good approximation, using a continuum analysis (Materials and methods, fourth paragraph). 1] Kramer, Jos, and Joël Meunier. "Kin and multilevel selection in social evolution: a never-ending controversy?." F1000Research 5 (2016). 2] Simon, Burton, Jeffrey A. Fletcher, and Michael Doebeli. "Towards a general theory of group selection." Evolution 67.6 (2013): 1561-1572. 3] Simon, Burton, Jeffrey A. Fletcher, and Michael Doebeli. "Hamilton's rule in multi-level selection models." Journal of theoretical biology 299 (2012): 55-63. 4] West, Stuart A., Ashleigh S. Griffin, and Andy Gardner. "Social semantics: altruism, cooperation, mutualism, strong reciprocity and group selection." Journal of evolutionary biology 20.2 (2007): 415432. 5] Gardner, Andy. "The genetical theory of multilevel selection." Journal of evolutionary biology 28.2 (2015): 305-319.  6] Goodnight, C. J. "Multilevel selection theory and evidence: a critique of Gardner, 2015." Journal of evolutionary biology 28.9 (2015): 1734-1746. We thank the referee for his interest and feedback. We have added discussion to clarify how heterogeneity was analyzed, in both the appendix (lines 436-460), and in the results (subsection “Social groups as Turing patterns”). We explain how spatial homogeneity would lead to take over by cheaters, and how Turing patterns are a necessary first step to have social evolution in our model. We also state that, because of the spatial structure, the cheaters do not enter cooperative groups very easily and remain localized in their own groups. Therefore, if there is no mutation, and only a fixed cheater, groups with cheaters would get taken over and die out, leaving the groups with cooperators. These groups are stable. However, there are random mutations, sociality can only prevail if the groups fragment faster than new mutants materialize (subsection “Social groups as Turing patterns”). We have also modified Figure 2 and included videos in Supplementary files 1-5 to better illustrate this main result. 1] The authors state that "It is well known that evolution of altruism in species strongly depends on the individuals being discrete (Durrett and Levin (1994)). This would seem to imply that deterministic models, e.g. involving differential equations for frequencies of different types, would never lead to cooperation, which is of course not true. Deterministic models can and do lead to cooperation. What was shown by Durrett and Levin is that discreteness can alter the outcome. For example, in our particular case, having a continuous population density can allow for the existence of “micro-mutant populations”’ which can spread easier between adjacent groups. Furthermore, the discreteness fully separates the clusters of microbes from each other, since there cannot exist fractional individuals. In reality, microbes are discrete, and we thus expect a discrete simulation to better model the biology. We have clarified this discussion in the paper (subsection “Social groups as Turing patterns”, last paragraph). Furthermore, the argument in Simon et al. (2012) for why group selection is different from kin selection is not primarily based on the asynchrony of individual-level and group-level events. Rather, it is a consequence of the fact that assortment (or, equivalently, relatedness) may have no influence on certain group level events, such as games between groups. We agree that this additional distinction also separates group selection events from kin selection ones. We have further clarified this in the paper (Introduction, fifth paragraph). In the first version of our paper there was a typo where integrals (summations) in Equations 2 and 3 were missing. However, simulations did take into account the sum. To be entirely clear, and to fully reassure the referees, we outline what the simulations do: Every microbe secretes a waste compound and a public good, and there are individual variations in the secretion rates of the latter (but not the former). To determine the spatial concentrations of these two compounds, we use the diffusion equation, treating each microbe as a source. The contribution of every individual, taking into account the individual variations in their secretion rates, is summed over. Since diversity within and across groups is an interesting subject we have now added some analysis of the heterogeneity of secretion rates. We have prepared Figure 5 and extra panels to Figure 6 to show the average secretion rate of the population in the different flow situations. Appendix 1: Figure 1 also illustrates the distribution of secretion rates in the system. Every peak corresponds to one group. We observe that while there is a wide diversity in cooperative behavior across groups, there is very little diversity within a group. This is because among two phenotypes the less cooperative one will always dominate the more cooperative one, prohibiting stable coexistence of phenotypes within a group. A final remark: There is still not a sum in appendix Equations 7, 8. This is because our analytical work has been significantly more difficult than simulations, and we were able to obtain formulas only when diversity in social behavior is ignored (and hence the reason for the original typo). 3] The authors' finding that without advection, cooperation cannot be maintained in their system is curious. This seems contrary to previous work by Hauert and colleagues (Wakano et al., 2009), which shows that cooperation is maintained in public goods reaction-diffusion systems. We suspect the difference between our model and Hauert et al. might be the mutation rate. We find that flow shear is absolutely necessary for stable cooperation to exist beyond a critical mutation rate. 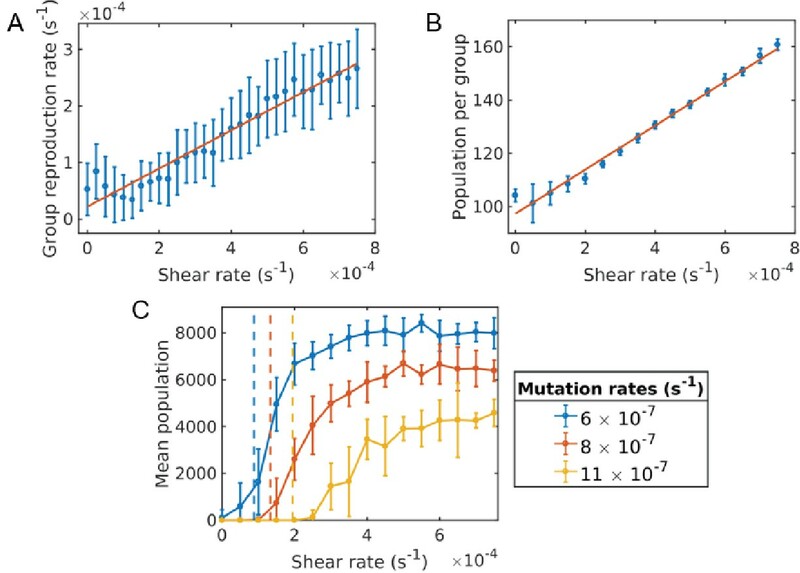 We now added a calculation of this critical mutation rate and compared it with our simulations (the agreement is within 25%) (–subsection “Evolution of sociality in constant shear for a binary phenotype”, last paragraph). I am wondering about the cause of the different outcomes in these models. Is it due to the continuous nature of the secretion trait considered in the present study? If so, this might be important to point out in the Discussion. Our findings are not sensitive to the discrete vs. continuous social phenotypes. To show this clearly, we now run two sets of simulations: In one set, the individuals are allowed to have a continuum of social behaviors, whereas in the other set they are binary (either cooperative or cheating). We have now included results in our paper that supports our findings for both models (Figure 4, 5). © 2018, Uppal et al.